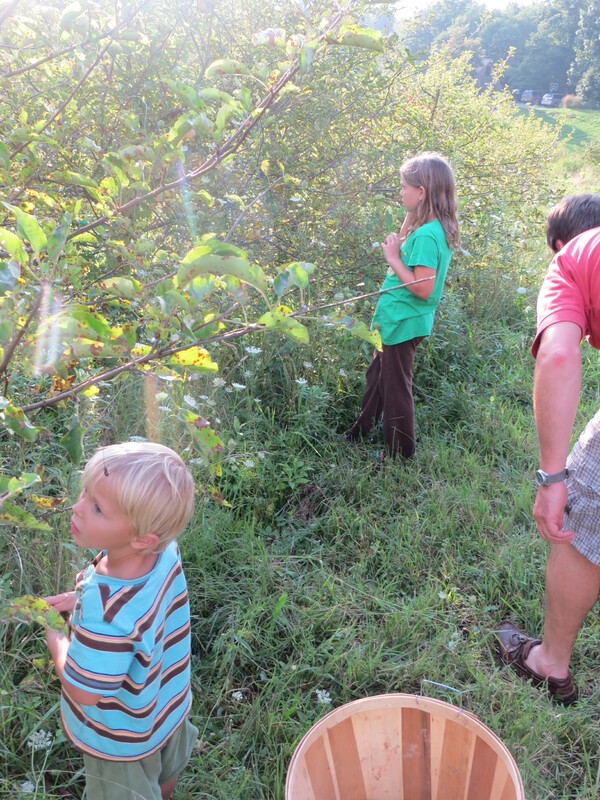 Yesterday evening we went out to pick apples in the orchard by our house. One variety is ready and we picked nearly all of them. The trees here are unsprayed–a bit of an abandoned orchard, though it is not old (only about 15 years). It is severely deficient in phosphorus, and the trees are on dwarf stock so they are very short and easy to pick. 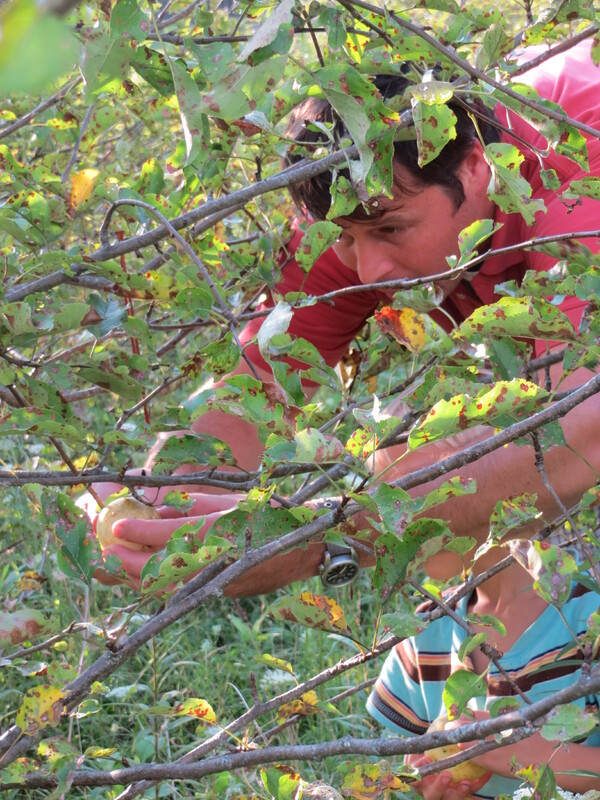 There are about 10 varieties in the orchard, all planted by William’s aunt. Anyway, halfway through supper, I suggested we go pick the rest of the Winter Bananas, the first apples to ripen. 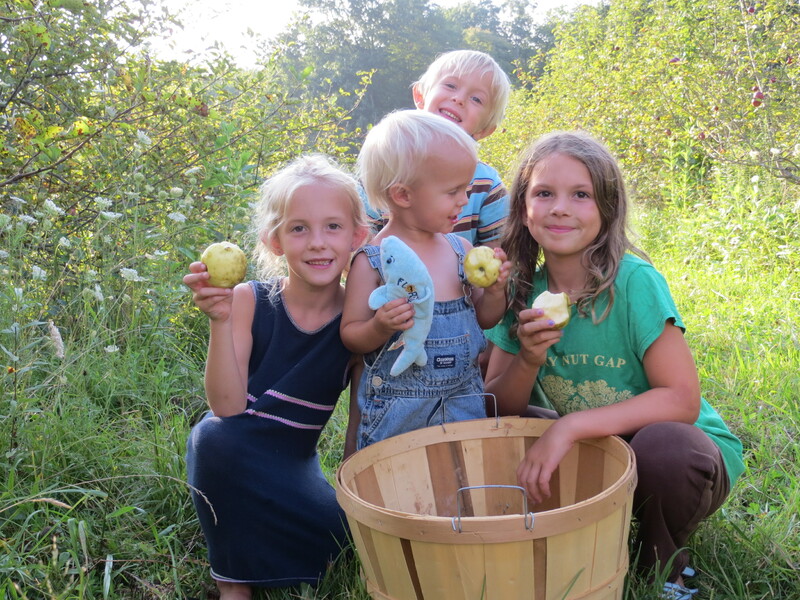 As with so many expeditions with children, it took a bit longer to get out the door with the bushel basket and into the orchard. Anne went upstairs to put on pants and found one of Evva’s small stuffed animals under her bed and so claimed it for herself. This caused a small kerfuffle. Evva did not want Anne to have the stuffed dolphin and Anne basically said “you have more stuffed animals than I do, so since this one was on the floor, it is only fair that I take it and keep it”. I told Anne that was not how life worked–you couldn’t take peoples’ things just because they had more than you. Hythe then started counting how many stuffed animals each girl had and stated what the difference was. Anne: Wow, Hythe, you just did mathematics! Hythe (face full of wonder and excitement): Mom! I just did magic! Me: Oh, buddy, she said you did mathematics, not magic. Still, it is almost the same! So, somehow, Steven ended up with the dolphin, Anne ended up in tears, but we finally all ended up in the orchard mostly with smiles. 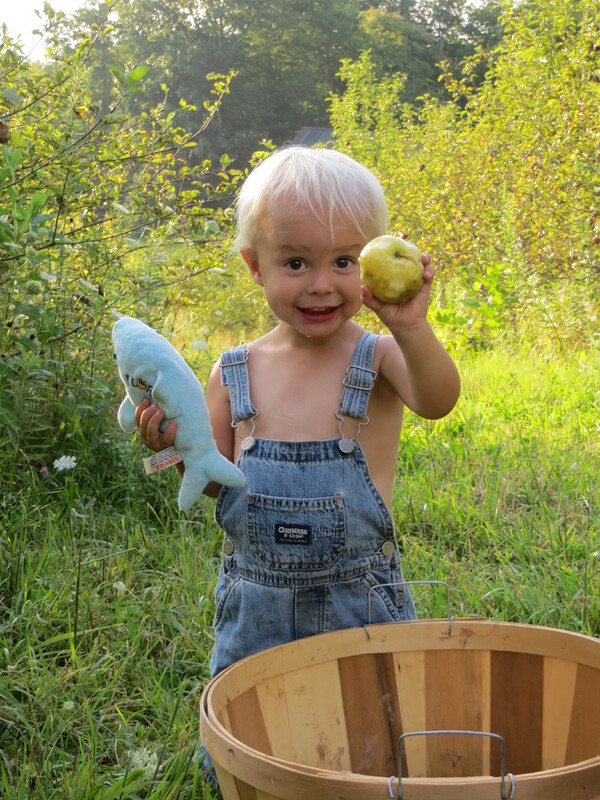 William taught Hythe how to pick apples properly. 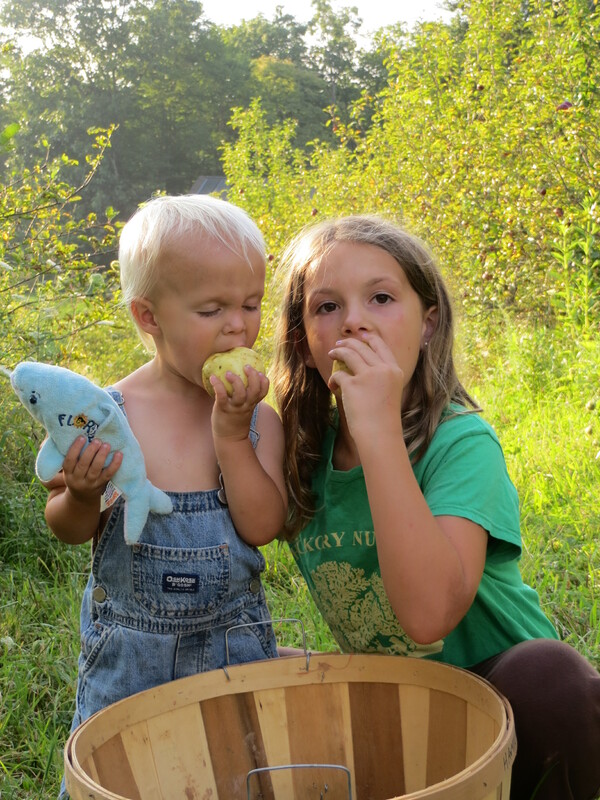 Everybody picked an apple to gnaw on–sweet, juicy, crisp, tart. It was really enjoyable. We picked nearly a bushel when all of a sudden, Evva, who is usually so quiet and controlled, started screaming hysterically. She pointed at a yellow jacket on her dress. I brushed it off and it landed on her chest. William ran up, picked her up, and ran home with her. At that moment I noticed how many yellow jackets were flying around. I told the other three kiddos to stand very still, and I looked for a nest. Very quickly I found it–a very small hole in the ground 12 inches behind Anne. I don’t know why or how, but no one else got stung and we ran home too. Evva, of course, had been stung twice.